Mike Chapman Gazette sports edtor Kinnick Saturday, some 60,000 rabid Hawkeye football fans will pour into Iowa City, eager for the dawning of yet another college football season. The band will play, pom-pons will flutter, cheerleaders will prance, fans will shout, coaches will stalk the sidelines screaming commands, athletes will play their hearts out. And many of those who enter Kinnick Stadium will remember one of the greatest Iowans who ever lived. He was born to Nile C. and Frances Ada Kinnick, Sr., in 1918, and they named him Nile Clarke Kinnick, Jr. His maternal grandfather was governor of Iowa from 1913 to 1917. Nile, Sr., played football for Iowa State, despite weighing just 135 pounds. But it was his son who was destined for greatness on the football field. He became one of the state's most talked-about prep athletes at Adel, starring in both basketball and football. His senior year, however, the family moved to Omaha, and Nile became first team all-state in both sports at Benson High School in Nebraska. He enrolled at Iowa in the fall of 1936. Irl Tubbs was the new head coach, and Stanford star Ernie Nevers, one of the truly great running backs in collegiate history, was an assistant. Iowa was just 1-7 in Kinnick's sophomore-year, but he was first team All-Big Ten at halfback, and was a third team All-America selection by NEA. Iowa was 1-6-1 in 1938, and Nile, bothered by a bum ankle all season, was just honorable mention all-Big Ten. And then came 1939. Eddie Anderson, a former All American at Notre Dame, became the new head coach at Iowa. He and Kinnick became fast friends immediately. And both became heroes. Iowa, underdog of the Big Ten for years, went 6-1-1, and became the darling of much of the nation. With Kinnick leading the. way, the Iron Men surged to win after win. Kinnick set 14 Iowa records, playing nearly every game all the way on both offense and defense. At season's end, he was given every major award possible. He was named the Big Ten's most valuable player by the largest margin ever, and won the Heis- man Trophy by a 651-405 count over Michigan's great Tom Harmon, who won it in 1940. Kinnick was voted the nation's top male athlete of 1939, with Joe DiMaggio second, and Joe Louis third. He became the most honored college football player since Red Grange. He was the first round draft choice of the Philadelphia Eagles, but he turned his back on pro football to enter law school. A Phi Beta Kappa, he constantly professed his belief that athletics were secondary to education, and he meant it. His Heisman acceptance speech is generally considered the finest ever made. 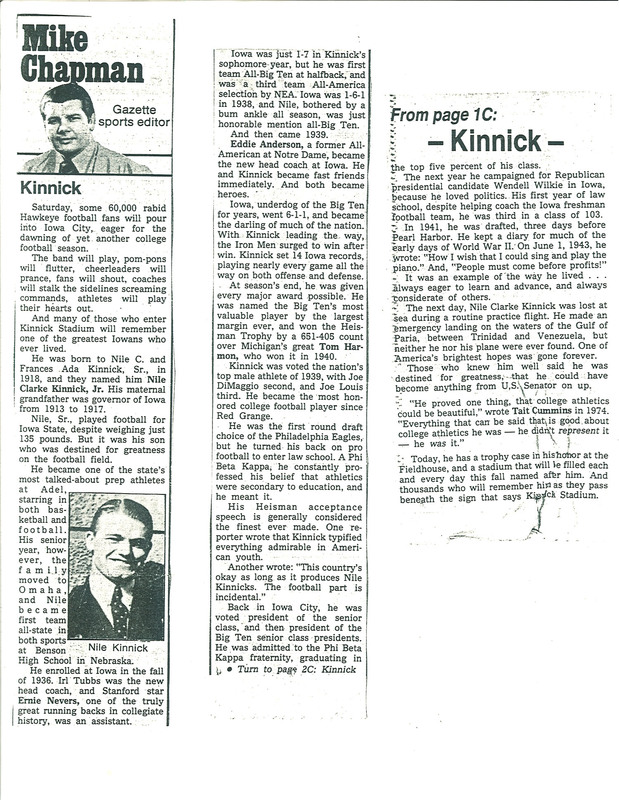 One reporter wrote that Kinnick typified everything admirable in American youth. Another wrote: "This country's okay as long as it produces Nile Kinnicks. The football part is incidental." Back in Iowa City, he was voted president of the senior class, and then president of the Big Ten senior class presidents. He was admitted to the Phi Beta Kappa fraternity, graduating in Turn to page 2C: Kinnick from page 1C: - Kinnick - the top five percent of his class. -. The next year he campaigned for Republican presidential candidate Wendell Wilkie in Iowa, because he loved politics. His first year of law school, despite helping coach the Iowa freshman football team, he was third in a class of 103. In 1941, he was drafted, three days before Pearl Harbor. He kept a diary for much of the early days of World War II. On June 1, 1943, he wrote: "How I wish that I could sing and play the piano." And, "People must come before profits!" It was an example of the way he lived . . . always eager to learn and advance, and always considerate of others. The next day, Nile Clarke Kinnick was lost at sea during a routine practice flight. He made an emergency landing on the waters of the Gulf of Paria, between Trinidad and Venezuela, but neither he nor his plane were ever found. One of America's brightest hopes was gone forever. Those who knew him well said he was destined for greatness, that he could have become anything from U.S. Senator on up. "He proved one thing, that college athletics could be beautiful," wrote Tait Cummins in 1974. "Everything that can be said that, is good about college athletics he was -- he didn't represent it -- he was it." Today, he has a trophy case in hishonor at the Fieldhouse, and a stadium that will le filled each and every day this fall named after him. And thousands who will remember him as they pass beneath the sign that says Kinnick Stadium.